The Environment Dictionary provides an essential source of information on all aspects of the environment. It includes all the basic scientific terms and concepts along with socio-economic, cultural, historical and political elements which impact on the environment. 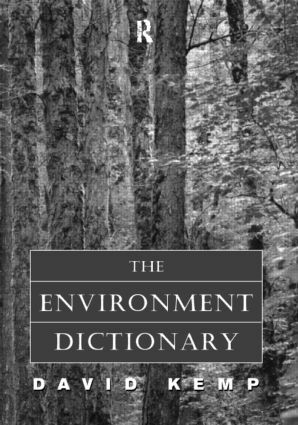 This dictionary provides the interdisciplinary approach required to understand environmental issues worldwide. Designed for a wide range of readers, the dictionary is up-to-date, easy to read and to reference and clearly and attractively presented. Selected environmental issues which have particular importance are treated in greater depth through a series of boxed case studies. A wide range of maps, diagrams, figures and photos illustrate the texts and extensie cross-referencing between entries ensures readers can build on their knowledge. References and further reading sections are drawn from a wide range of accessible sources - from newspaper articles and popular magazines to academic texts and journals and provide easy access to further study and development of readers' specific interests.